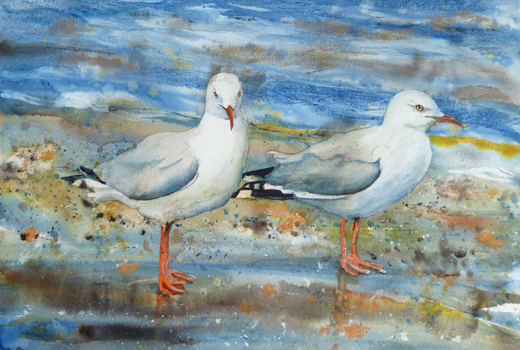 I would like to introduce two of my newest artworks; “Gulls Conversation” and “Orange Feet.” I chose this subject matter because I enjoy the graphic quality of the birds’ markings against the background of their environment. I enjoy exploring visual intersections; observing the edges of things where the light meets the dark, where the natural meets the human-made, where the old meets the new, land meets water. During the recent few years, my concentration has been the development of textural techniques with 2-D media to better express the qualities of the subject matter. The recent works use many techniques to depict and express the mood of the birds in relation to their environment. The process is an integral part of the product. I work freely, incorporating materials and tools that satisfy the mood and spirit of the painting. For these pieces, I used traditional watercolors, gesso, acrylic paint, thai unryu paper, mat board scrapers, sponges, button thread, a stiff bristled oil painting brush, traditional watercolor brushes, my fingers, a toothbrush, and spray water bottle. Gulls Orange Feet inspired by sea gulls flying close to the Singer Island beach. 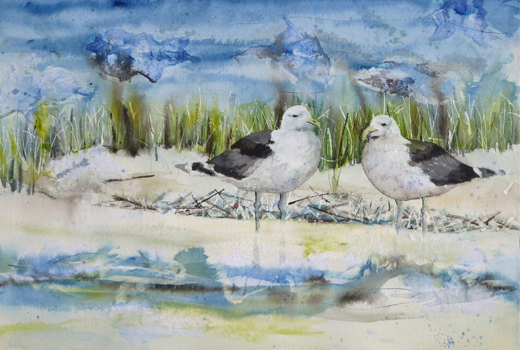 Gulls-Conversation inspired by sea gulls flying close to the Singer Island beach. I have a cousin with whom I’ve only met once or twice as a child. I have no idea what circumstances kept us apart, but we never had an opportunity to become well acquainted. We both became artists. David is also a highly respected yogi and instructor in New York City. And I, after experiencing several years of very serious back pain, have found myself very devoted to practicing yoga as therapy for my back and my psyche. A recent trip to New York City seemed like the optimal time to develop a dialogue with David. Upon meeting, questions came pouring out about David’s choices of subject matter, the relationship of the yoga practice to his artwork, methods of drawing and painting and the figurative art scene in New York. One of my first questions to David was an instructional one. I plan to begin doing life sketches in yoga class. Because, I haven’t drawn from life in some time and feel very rusty, I asked David, who draws everyday, and attends life drawing classes, how to begin. He told me to prepare by familiarizing myself with structural artistic anatomy. The skull, rib cage and pelvis are the most important. David professes to be an anatomy geek and has worked with master dissectionists to study the human body. He has gone so far as to attend human body dissections that help to inform his work as well as his yoga practice and teaching. In January David will work with Tom Myers, Master Dissector, in Arizona, to learn more about human anatomy. For his personal work, David prefers to work with live models, but also uses photos. He advised me to treat the process of drawing a person the same way I might draw an apple; as light on form. 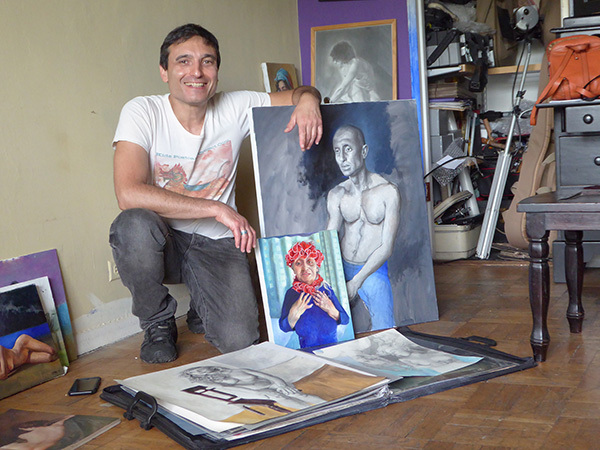 I’ll be publishing more art, anatomy and yoga Q and A with David Michael Hollander in the future. For now, wish me luck in my yoga class sketch endeavor! 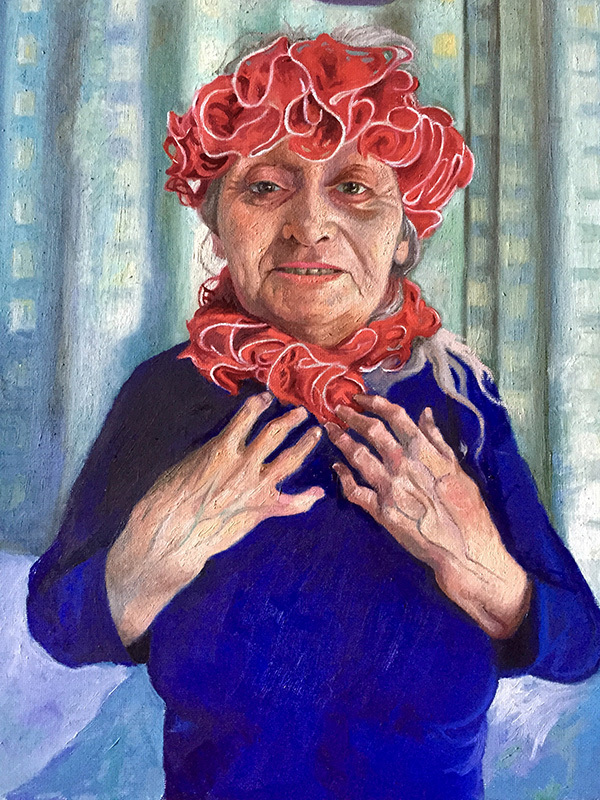 Portrait of Sondra Hollander, David’s mother, who suffers from Alzheimer’s Disease. Once again, I was asked to exhibit my work in several locations during the coming season. Each location sounded like a wonderful opportunity for exposure and possible sale. The downside was that few of the venues provided insurance. In fact some insisted that I sign an agreement, not holding the venue responsible for the safety of my work. This sad situation is all too common. I turned to Sheryl Wood to see if she could enlighten me about art insurance for artists. Sheryl is an attorney who has studied the art business and fine art appraisals at NYU for the last several years and will be attending Art Law Day in November. This article serves as an overview. We’ll compile some more detailed questions about art insurance for Sheryl for a future article. Please submit a comment in the area provided below or email me to ask some of your own questions. Please note: This is not intended as legal advice. Any advice will always depend on the specific facts and circumstances of a particular situation. CH: Do artists need to have insurance? SW: Dependent on value of course, it is important for professional artists to insure the work that is in their studio. Certainly galleries and museums need to be covered, but the artist cannot always count on that when consigning work or loaning out for an exhibition. It should be clear in their agreements who bears the risk of loss. Not something artists like to talk about when getting excited about doing an exhibition. Artists should always have an agreement. READ it BEFORE signing it. Agreements are usually one sided as to who drafted, that is why it is a good idea for the artist to have their own agreements that can be negotiated. Obviously, depending on who bears the upper hand and how badly the consignee or museum wants the work will play a hand in that negotiation, but that doesn’t mean the artist shouldn’t take the lead when it comes to his or her work. CH: how does an artist determine the value of their work for insurance purposes? SW: If insured for replacement value, make sure it is for “retail” replacement value, not the artist’s cost for the materials (which unfortunately is what the IRS allows when the artist makes a donation of his work — as opposed to a collector who gets a fair market value deduction for the same donation). You have sales comparables for work so I would imagine you can use that for reference. Then I would think you would need some sort of schedule that allows for rotation when you make a sale. CH: Sheryl thank you so much for your time and expertise. SW: You are very welcome. I look forward to responding to more questions. I can be reached at artlaw@earthlink.net. 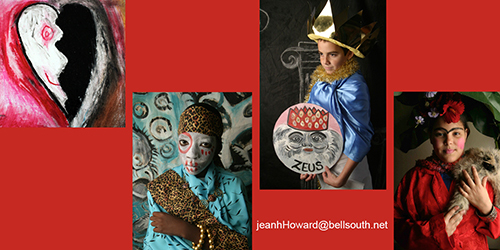 I recently worked with an enormously talented arts-education integration specialist and photo-journalist, Jean Hart Howard. She asked if I could add some interest to her resume. The resume was robust. It was filled with lists and descriptions of Jean’s credentials, experience, exhibits and awards. However, the text heavy resume prevented the reader from grasping her high level of creative energy and expertise. We worked together to select photos from her arts integration teaching classes to create a grid in the center of the resume that showed the work of her students. Text was edited and headings were bolded and colored to match elements from the featured artworks. Visual elements add more interest and “personality” to a resume or one page business information sheet. A few weeks a go The Rickie Report asked me to complete an article about internationally acclaimed sculptor, Steve Blackwood. I always enjoy working with Rickie but this time I was particuarly excited about the request to write an article. I had recently returned from the “Reimagined” exhibit at the Delray Center for the Arts at Old School Square. I found much of the work captivating and was thrilled to learn that I now had an opportunity to speak directly with Steve Blackwood, one of the artists whose work I admired. My focus was on Steve’s process. I have a background in industrial design and currently work as a graphic designer and fine artist. I appreciate that in order to produce the mixed-media, sculptural pieces Steve must combine numerous materials, forms, and finishes. For many of his smaller pieces, Steve works with found objects. The smaller scale permits him to experiment with the elements’ position and relationships until the assemblages look just right. The larger pieces are planned more carefully because of the time and cost involved with experimenting. Many sketches are begun in Photoshop which allows Blackwood to simulate how parts will come together. Sometimes Steve uses ebay and etsy to get parts for projects. When the items in his imagination cannot be found, he calls upon other artists and craftspersons to fabricate items. Is a rainbow the promise of good things? I always feel sad on the first day of school. The long sunshine and freedom filled days of summer suit me better than any other time of year. Even now, as an empty-nester, I still feel a little sad as autumn approaches and days grow shorter. Nearly every time that I have dropped one of my precious children off at a location that caused me sadness or anxiety; first day of school, sleep away camp, or college, I would look up into the sky and see a rainbow. I always felt that it was a sign that things would work out well. Today is the first day of school for Palm Beach County school children. 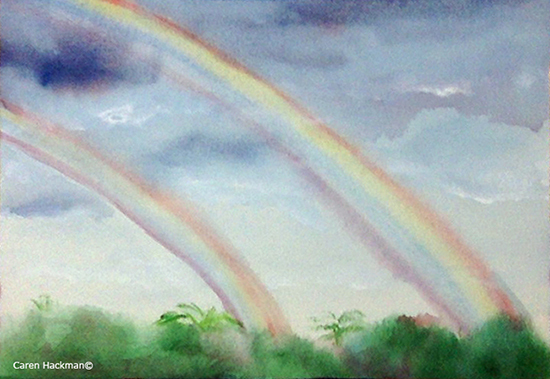 As I took an early morning walk with my greyhound, I enjoyed two rainbows in the sky. One was the largest I’ve ever seen and the other smaller. I hope there are parents who enjoyed the show…or maybe it was just for me and my first day back in the studio after vacation. In the summer of 2012 friends hosted me for a few idyllic days at their vacation home off the coast of Massachusetts. This summer I’ll be returning to the island to share in their wedding celebration. As a gift, I thought that I would paint one of the inspirational scenes from the island. I chose the subject matter, worked on the composition and began to paint a very straightforward rendition of the scene. My work looked OK but lacked the energy that I felt during my visit. I knew exactly what I needed to do. I needed my carefree textural painting style. For many years, I had thought of the textural painting style as a way of cheating my transparent watercolor expertise. I began using the painting method as a way to salvage paintings that were not progressing as planned. My first discovery of this technique was when I had an expensive piece of 40″ x 25″ watercolor paper fastened to a large board. The painting on which I was working wasn’t developing the way I’d hoped. I decided to wash off the paint so as not to waste the paper. I took the 48″ x 30″ board into the shower and scrubbed. Some paint came off and some had stained the paper. Thinking that I had nothing to lose I mixed media, scraped paint, added handmade fiber-filled paper and generally had a grand time! The painting was a great success. Over time, I did this more frequently. I stopped waiting for accidents and began paintings incorporating these techniques as part of the overall plan. 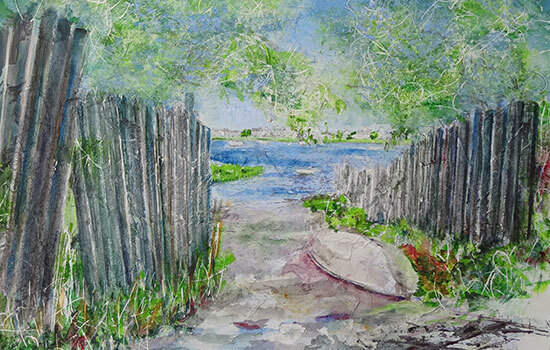 I used the traditional rendition of this island scene as a study and restarted on fresh paper using the textural technique. When the painting was completed I scanned my large work table and dirty fingers to assess all the materials involved in the process. I’d used traditional watercolors, gesso, acrylic paint, thai unryu paper, mat board scrapers, sponges, button thread,a stiff bristled oil painting brush, traditional watercolor brushes, my fingers, a toothbrush, and spray water bottle. As a columnist with The Rickie Report, an online news source for artists in Palm Beach County and beyond, I respond to questions that pertain to visual communication, extending some of the basic information covered in my book, Graphic Design Exposed. This article is a little different and a lot of fun. The Rickie Report invited me to investigate how best to introduce young people to art and at what age. The article appears on The Rickie Report site in two installments. For this article I consulted with three experts. I am very grateful to Glenn Tomlinson and Lyda Barrera and Christina Barrera for taking the time to answer my questions and share their experience. Below are some excerpts from the interviews with Glenn, Lyda and Christina. 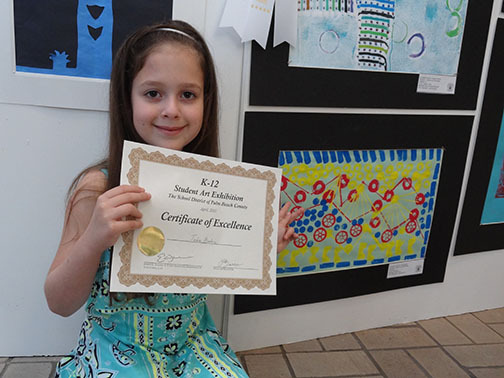 Lyda Barrera has taught elementary school art in the Palm Beach County School District for 25 years. She and her daughter, Christina, also work privately with students to prepare them for auditions at Bak Middle School of the Arts and Dreyfoos School of the Arts. 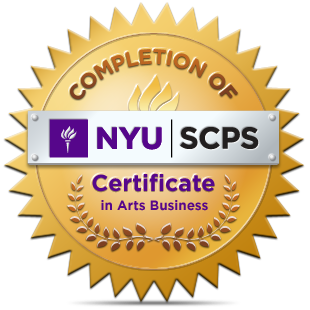 Christina, a professional artist, is an Undergraduate Admissions Counselor at the School of Visual Arts in New York City. She spent two years working as a Museum Educator at the Walters Art Museum in Baltimore, Maryland. Caren: You’ve told me that most children draw freely without instruction before they begin taking classes. Then you ask them to draw from observation. Lyda: Drawing from observation engages the brain in a different way than free expressive art, which is also important but is not engaging their brains the same way. Christina: It’s important to make sure that young kids be told that there is no wrong way to make art. Later, I think it’s important for students to gain skills and challenge their brains to learn to analyze what they’re seeing and draw from observation, but it’s also so important to tell kids that there’s no wrong way to make art — it can’t be “right or wrong.” It helps prevent them from getting discouraged because a project doesn’t look “right” or they’re “not good”. Seeing and making art, developing motor skills and creativity are all important parts of development and can enrich someone’s life forever if they’re creativity isn’t invalidated early on. Glenn Tomlinson has served as the William Randolph Hearst Curator of Education at the Norton Museum of Art since January, 2001. Prior to that time he worked in museum education at the Philadelphia Museum of Art and at the Pennsylvania Academy of the Fine Arts. He lives in Jupiter with his family. The Q and A with Glenn can be found here. Caren: Are there basic principles to which beginners should always be introduced as a first exposure or lesson? Or do you work with exhibits that are available in the galleries? Glenn: There are so many points of entry into art. One of the ways that we like to work is by developing literacy skills and critical thinking skills. Exploring the elements of art (line, color, shape/form, space, texture) is a good way to help develop a vocabulary for looking at art (and everything else, btw!). Then, by discussing how the elements of art work together to create composition, for example, you exercise a child’s critical thinking skills. Take it one level further, by looking at a second artwork, and comparing the second to the first… learning can happen in such meaningful ways through this kind of process. 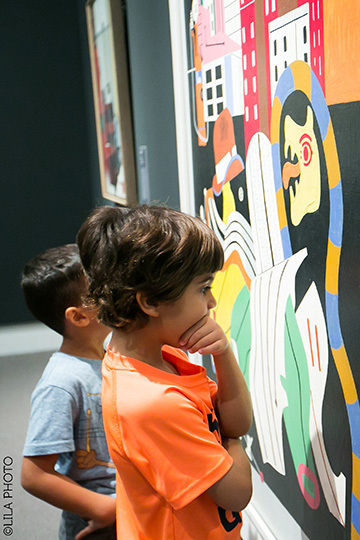 And we can use a wide variety of artworks for these lessons, so we do use special exhibitions and the collection. Please read the articles in their entirety. The Rickie Report a FREE publication, is read worldwide. You can subscribe to it HERE. In order to have the best possible out come for their web and print communications it is helpful for my clients to understand the differences between vector and raster art. This understanding permits us to work together closely so that all of the images we use are clear and appropriate. A raster graphic is an image made of hundreds (or thousands or millions) of tiny squares of color information, referred to as either pixels or dots. Pixels refer to color blocks viewed on an electronic monitor where as dots refer to the ink dots on a printed piece. The most common type of raster graphic is a photograph. The designer’s preferred program for creating and editing raster files is Adobe Photoshop. Popular raster file format extensions include: jpg/jpeg, psd, png, tiff, bmp and gif. Rich Detail: “DPI” means “dots per inch,” a measurement of how much detailed color information a raster image contains. If you have a 1” x 1” square image at 300 dpi—that’s 300 individual squares of color that provide precise shading and detail in your photograph. The more dpi your image contains, the more subtle details will be noticeable. Precise Editing: All of those individual pixels of color information can also be modified, one by one. If you’re a true perfectionist, the level of editing and customization available in a raster image is almost limitless. Blurry When Enlarged: The biggest downfall to raster images is that they become pixelated (aka grainy) when enlarged. This is because there are a finite number of pixels in all raster images; when you enlarge a photo, the computer takes its best guess as to what specific colors should fill in the gaps. This interpolation of data causes the image to appear blurry since the computer has no way of knowing the exact shade of colors that should be inserted. Large File Size: Remember how a 1” x 1” square at 300 dpi will have 300 individual points of color information for the computer to remember? Well let’s say you have an 18” x 24” photo— that’s 129,600 bits o’ info for a computer to process which can quickly slow down even the faster machine. A vector graphic uses math to draw shapes using points, lines and curves. Whereas a raster image of a 1” x 1” square at 300 dpi will have 300 individuals pieces of information, a vector image will only contain four points, one for each corner; the computer will uses math to “connect the dots” and fill in all of the missing information. The most common types of vector graphics are fonts and logos. The designer’s preferred program for creating and editing vector files is Adobe Illustrator. Infinitely Scalable: Vector files can be scaled up or down as much as you want without losing any image quality. Whereas a raster image must guess the colors of missing pixels when sizing up, a vector image simply uses the original mathematic equation to create a consistent shape every time. Edibility: Unlike popular raster-based formats, such as a jpg or png, vector files are not “flattened.” When reopened in a program such as Adobe Illustrator, all of the original shapes exist separately on different layers; this means you can modify individual elements without affecting other objects in the image. Limited Details: Because of the way that vector files retain data, they are not practical for complex images that require exact coloring. You can create basic color gradients, but will never be able to match the color detail available in a raster image where each individual pixel can be its own individual shade. Limited Effects: By definition, vector graphics are created from simple points and lines. This means they can’t handle certain styling effects, like blurring or a drop shadow, that are available with raster images. I’ll be participating in Continuum West Palm Beach this week. 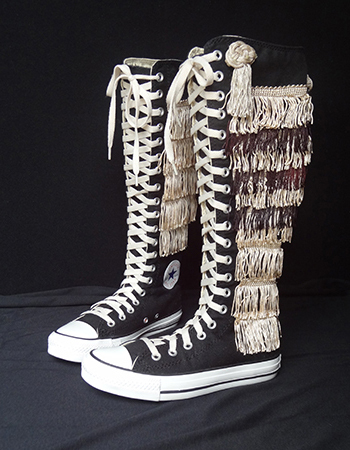 The evening of January 21, a pair of Converse All Star high top sneakers that I “styled” with fringe will be auctioned off to benefit Faith’s Place after school program. The sneakers are wearable and comfy! CONTINUUM is a pop-up art gallery at 501 Fern St. in downtown West Palm Beach that takes place during ArtPalmBeach and the American International Fine Art Fairs; January 21 – February 7, 2015 Please visit the gallery or let me know if you would like to bid on this super unique, stylish foot ware.